On 2 April, Maundy Thursday, Cardinal Vincent celebrated the Mass of the Lord’s Supper at the Cathedral. 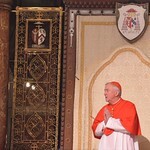 The Cardinal was joined by the Apostolic Nuncio, Archbishop Antonio Mennini, who concelebrated. The Mass remembered Christ’s institution of the Eucharist at the Last Supper and the washing of His disciple’s feet. In commemoration of Jesus’s act, Cardinal Vincent washed the feet of 12 Chelsea Pensioners during the service. In his homily, Cardinal Vincent spoke about the washing of the Disciples’ feet which he described as ‘an expression of divine love’. In addition to the washing of the feet in the Mass, all the church bells were rung during the Gloria and will now remain silent until the Gloria of the Easter Vigil on 4 April. At the end of the Mass the Blessed Sacrament was solemnly processed from the Sanctuary to the Altar of Repose in the Lady Chapel of Westminster Cathedral. In addition to the washing of the feet in the Mass, all the church bells were rung during the Gloria and will now remain silent until the Gloria of the Easter Vigil on 4 April. At the end of the Mass the Blessed Sacrament was solemnly processed from the Sanctuary to the Altar of Repose in the Lady Chapel. These consecrated hosts will be used during the Passion of the Lord on Good Friday. Both of the traditions of the silencing of bells and the removal of the Blessed Sacrament from the Tabernacle during the Mass of the Lord’s Supper are done to enhance the mournful atmosphere in which we commemorate the Lord’s Passion on Good Friday. For photos of the service, please click HERE or HERE.